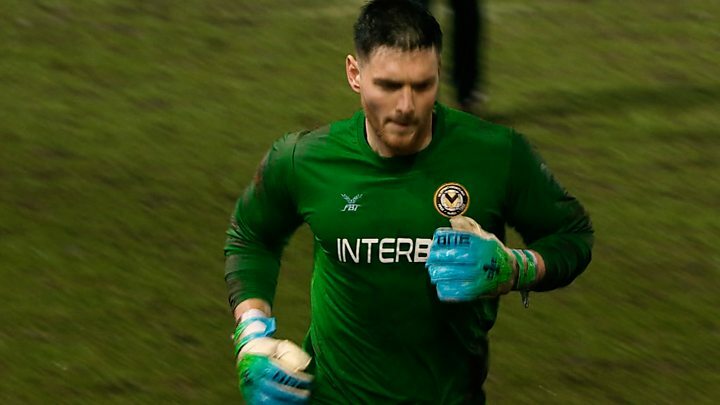 Newport County goalkeeper Joe Day has said he did not know his wife had given birth to twins until his team’s FA Cup match had ended. The 28-year-old was playing a game against Middlesbrough while his wife Lizzie Day was in labour. Day was seen running from the pitch at Rodney Parade to get to the Royal Gwent Hospital on Tuesday evening. He said he and his wife “always knew there was a chance” she would give birth during the game. He added: “Lizzie backed me and made it an easy decision for me to play the game. “Nothing was really happening at midday on Tuesday, but as I was driving to the game Lizzie called me to say that her waters had gone. “I got to the ground when she was being taken to the labour ward but she told me to concentrate on the game. Speaking to the BBC’s Good Evening Wales programme, Day said they were all doing well. 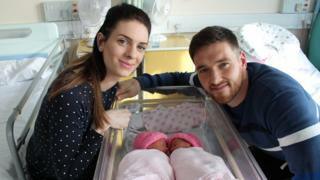 Sophia Grace and Emelia Lillie were born at about 20:20 GMT. Day explained that he did not know he had become a father until he got into his car to drive to the hospital. “The whole evening was a bit surreal,” he said.